You've selected Alaska. The following programs are available for you. Alaska TAP Online (Training for Alcohol Professionals) is a comprehensive Alcohol Server and Seller Training program designed to provide the tools necessary for you to be able to sell and/or serve alcohol responsibly, legally and safely. If you have previously registered an account on our old system, you will need to re register with a new account from this page to complete training on our new system. If you wish to access your account on our old system to print/save your certificate of completion issued prior to 06/2/2018, please log into our old system at http://www.alaskatap.com. Alaska TAP online is an APPROVED alcohol server/seller training program in the state of Alaska. Alaska TAP online is for those who work for a common carrier (ferry, boat, train or airplane) and licensees (and their employees) located in rural areas, Rural area licensed establishments are licensed premises not on a statewide road system or further than 50 miles from a city where a classroom course is offered at least once each month. Check the TAP page at http://www.alaskacharr.com for a list of instructors and classroom schedules. Following the Final Exam, you must fill in the mailing address for your employer. Upon successful completion of the online course and test, your TAP card will be mailed to your place of employment. Should you not currently work at a licensed establishment, your TAP card will be mailed to your mailing address. The Alaska TAP Online training program is a self paced learning module that can be administered at any time. This program is easy to follow and was designed to help you learn what it takes to become a responsible alcohol server and/or seller. Upon completion of the learning module, you will be provided a 50-question multiple choice test and certification is valid for a period of 3 years. Once you pass the test, you will be able to print your temporary certification card and you will receive your permanent certification card in 7-14 business days. This course is APPROVED by the Alaska Alcohol and Marijuana Control. The Alaska TAP alcohol server/seller training program will teach you how to serve alcohol responsibly, handle difficult situations, detect and deal with drug use or sales, check for proper ID, and understand the effects of alcohol and the human body. This training program is specifically designed for those who own, manage and work in establishments serving/selling alcohol in the state of Alaska. Responsible alcohol service education is extremely important for all those working in this industry. How much does it cost to take the TAP Online program? Can I take the course on my smart phone? Yes. This website and training course are fully functional on any smart phone, tablet. laptop computer or desktop computer. This course should take 2 to 3 hours to complete. You may wish to spend additional time to study or review information that you have already covered within the program prior to taking the final quiz. Why should I take this course? What are the benefits? All those involved in the sale and/or service of alcoholic beverages in the State of Alaska are required to receive training by an approved RBS training provider. This program is approved in the state of Alaska. In addition to becoming compliant with the mandatory RBS training law, it is also extremely beneficial to learn the material covered within this program to help you perform your job functions safely and legally. Does the TAP online training program count towards a discount on alcohol liability insurance premiums for my employer? Many insurers allow for a discount on liquor liability insurance premium. Please check with your insurance company. How long is my training good for? Certification is valid for a period of 3 years effective from the date you complete the course and successfully pass the final exam. Do you offer face-to-face training classes? Face-to-face TAP training classes are available state wide. Please visit http://www.alaskacharr.com for a list of upcoming classes. There is a 50 question exam at the end of the course. Proctored exam: You are to have a supervisor, manager or owner proctor your final exam. This means that he/she must be present while you complete your exam. You are to enter their name in the 'Employer' field of the registration page when registering. If you are not employed at any licensed establishment, enter 'NA' in the 'Proctor' field when taking the Final Exam. What if I fail the exam, can I re-take the test without having to pay for the course again? Should you fail the final exam, you must re-purchase the course and take the training again. How will I get my certification card? Proof of completion may be printed from the user account page once you have completed the course and passed the exam. You will also receive your certification in the mail within 10-14 business days. The CannabisHander.com Best Price Alaska Marijuana Handler Permit Training course is developed to provide you the tools needed to own, manage and work in a marijuana establshment legally and responsibly in the state of Alaska. 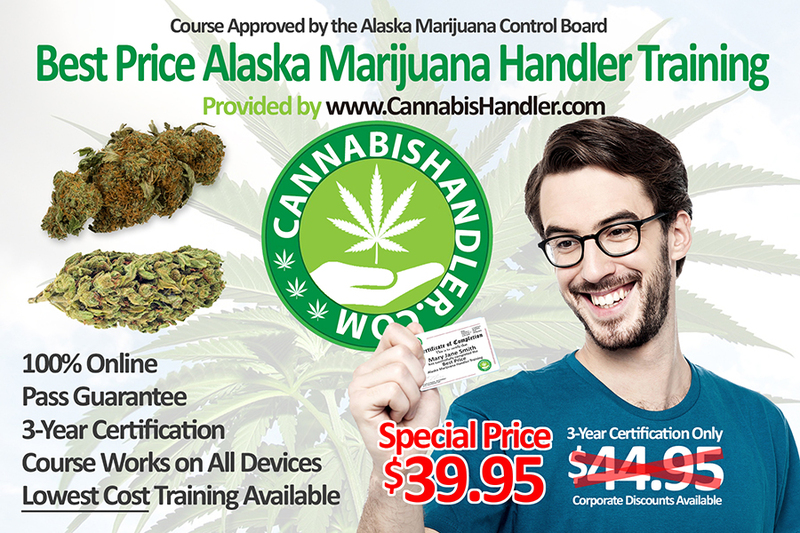 Completion of this course is required to obtain your Marijuana Handler Permit in the state of Alaska. At just $44.95, this is the lowest cost of any AMCO state approved training providers. Registration is quick and easy, and the course player will work on all devices, including smart phones, laptop computers and desktop computers and will work on both Windows and Macintosh platforms. The system even tracks your progress so you may log out at any time, then resume training right where you left off!! In the state of Alaska, every licensee, employee, or agent of a marijuana establishment who sells, cultivates, manufactures, tests, or transports marijuana or marijuana product, or who checks the identification of a consumer or visitor of a marijuana establishment, must complete a state approved Alaska Marijuana Handlers Certification course and obtain a marijuana handler permit card from AMCO (Alcohol & Marijuana Control Office) before being licensed or beginning employment at a marijuana establishment, per 3 AAC 306.700. Marijuana handler permits are valid for three years from the date of issue. PASS GUARANTEE!! Following the training, you will have access to the final exam... don't worry, we don't believe in trick questions and the lesson quizzes are designed to help you test your knowledge. A passing score must be received in order to receive your three year certification. Failing to pass the final exam on three attempts will result in having to re-take the training for another attempt at the final exam. There is NO FEE to retake the training for a failed exam. To learn more about obtaining your Alaska Marijuana Handler Permit card visit the Alcohol & Marijuana Control Office website HERE. 1. Complete a Marijuana Control Board approved Marijuana Handler Permit Education Course. 4. For applicants who live near Anchorage or Fairbanks: Bring a copy of your Standard Cover Page, your original Marijuana Handler Education Course Completion Certificate, an original passport photo (Fairbanks office only), and a valid form of photo identification to your local AMCO office (see below for office hours). Your card will be issued and provided to you by AMCO staff. Once you have completed the above bulleted requirements and still have a marijuana handler permit question, you may send your question using our Contact Us page.